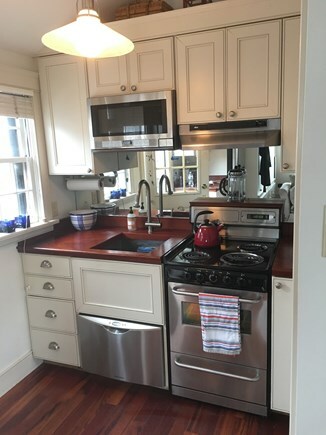 In-town pied-a-terre, near beach, perfect for 2. A peak towards the condo from the street. The front door from near the foot of the bed. A peak into the bathroom. The patio in early morning from the front door. The coffee shop down the street. More pictures of the cottage coming soon! Not renovated in 2018, not featured in any magazines - and not too expensive! Cisco is a small, 1 room cottage, perfect for 2 people who want to be near town and across the street from the beach. Walk to the unit from the Straight Wharf ferry dock; you will not need a car! 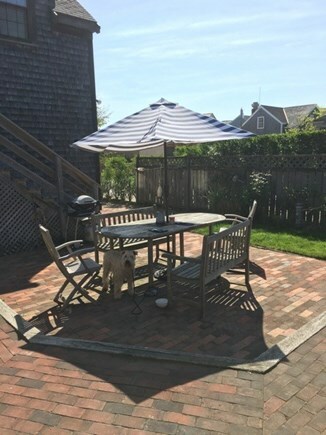 It is located across the street from Great Harbor Yacht Club and the marshes, an 8 minute walk to town, and a 1 minute walk to the beaches along Nantucket Harbor. Enjoy morning coffee on the patio, at the nearby coffee shop or walk across the street to the beach. The condo includes 1 queen bed, a complete kitchen and 1 bath with stall shower. There is a very pleasant outdoor patio with grill and dining table that is shared with the other 2 units. Other amenities include a dishwasher, washer/dryer, and an outdoor shower. You have the flexibility of walking downtown for dinner or walking to either grocery store and the fish market so you can cook on your own! This condo is on floor 1 of 1. Additional pricing info: State and local taxes of 11.7% will apply. One step up from the patio to the front porch and 1 step up into the unit. Great location. 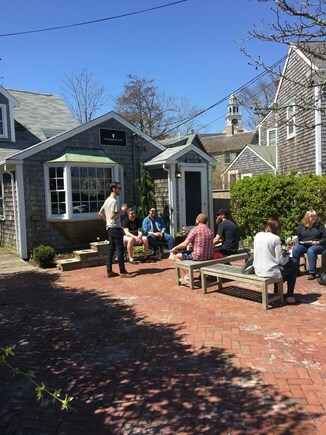 The feeling of an old-time Nantucket cottage. Much less expensive than a hotel and the kitchen lets you control food expenses as well.